In 1975, Sesame Street had only been on the air six years, but already, it had revolutionized children’s television and was considered a cultural institution. From the beginning, it was a hit. “’Sesame Street’ Dazzles in Television Premiere” read a headline in Variety. The show was aimed at preschoolers and had specific goals about reflecting accurate and nonjudgmental depictions of the lives of inner-city kids; it was set in a brownstone tenement, and the cast included strong African American characters Gordon and Susan (who were the cornerstone of the street) and Hispanic characters Maria and Luis (added in 1972). White characters were deliberately in the minority. They also cast everyday kids, not child actors, to play the children of Sesame Street. According to author Michael Davis’s 2008 book, Street Gang: The Complete History of Sesame Street, at the end of its first year, Sesame Street was in the homes of 1.9 million Americans, and a decade later, more than 9 million American kids under the age of six watched it daily. Among Sainte-Marie’s first Sesame Street appearances was a location shoot in Taos, New Mexico, for a full week of shows. Producers even temporarily changed the theme song to begin with, “Sunny day, coming to Santa Fe,” and end with, “We’re a long, long, long, long, long, long way from Sesame Street.” In one of the episodes, Sainte-Marie takes Big Bird and his human friend Maria to visit Taos Pueblo, an Indigenous community in New Mexico. Sainte-Marie’s performance is quite natural, and her rapport with future lifelong friend Sonia Manzano, who played Maria, was immediate. Through a handful of scenes, Sainte-Marie manages to convey some vital information about Indigenous people, including that, while she’s Cree from Canada, there are hundreds of different tribes and nations with their own languages and customs and culture and that she’s a guest there too. She also sings a few songs and plays the mouth bow, and they find out about the children’s way of life in the pueblo. When she was growing up, Sainte-Marie had very few visible touchstones or pop-culture role models of people who looked like her. The landscape presented a largely white, homogenous North America, but she hoped to change that through Sesame Street and through songs like “Generation,” a thundering, bluesy track recorded for her 1974 album, Buffy, which addressed inequality and was also anchored in real-life happy memories. Sainte-Marie’s first Sesame Street appearances were so successful that she became a recurring cast member. She balanced her ongoing commitment to the show with her activism, her new relationship, and a tour to Australia. In 1975, she was looking for a new road manager when she met her future best friend, Kayle Higinbotham. Sainte-Marie hadn’t harboured any long-held dreams of being a parent and was surprised when she found out she was pregnant. “Very much surprised! And very happy.” She and Sheldon Peters married and welcomed Dakota Starblanket Wolfchild, or Cody, to the world in 1976. Sainte-Marie loved reading to baby Cody, making up songs to narrate their time together, communicating with him constantly. When Sweet America, her 1976 album, failed to garner much attention, she matter-of-factly assumed that the day she’d always known was coming had arrived: her guest appearance in show business was over—though, by then, it had lasted twelve albums longer than she thought it would—and it was time to move on. She’d concentrate on raising Cody, do a few concerts a year, and keep writing songs, just not explicitly for the purpose of putting out a record. She’d also keep working part-time on Sesame Street, folding her little family into the mix as well. 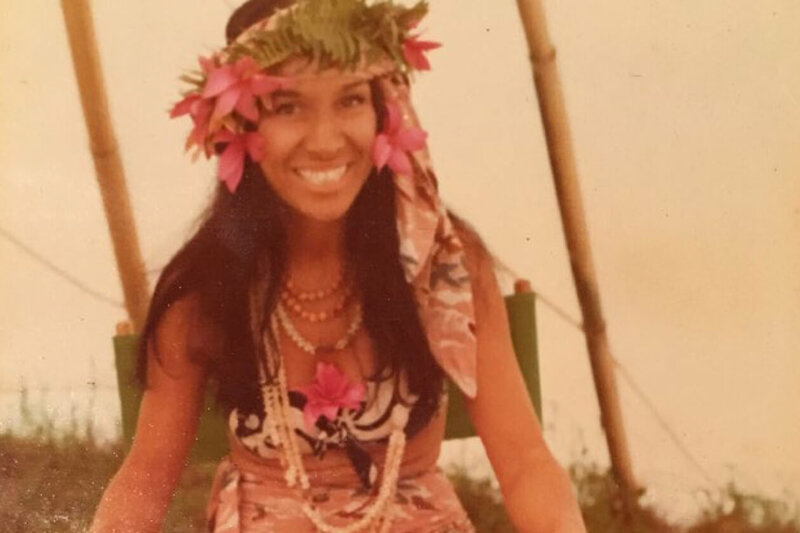 Sainte-Marie had long had a teepee set up in the backyard of her Hawai‘i home in what later became her goat pasture. Hundreds of people showed up for the luau, including locals and the Sesame Street cast and crew who’d come over for a few weeks of taping. Oscar the Grouch found a temporary new home inside an old truck that she hadn’t had towed yet from her yard. “With our local people and the Sesame Street scouts, they found a mountain that kind of looked like Snuffleupagus, who was Big Bird’s imaginary friend,” Sainte-Marie recalls. Sainte-Marie’s character was, initially, the only adult who could see Snuffleupagus, which was part of her bond with Big Bird, who was for a while hugely jealous of baby Cody. “I didn’t know it would ever become a big deal,” she says. “And I really didn’t care. But I did know how hard it was for mothers like me to get information and encouragement about breastfeeding even from their doctors, and I just wanted to be a part of fixing that. Now people will get a chip on their shoulder on one side or the other, but then it was no big deal.” It’s also not a big deal to Big Bird. He’s curious and asks a question, and Sainte-Marie respects his curiosity and answers his question, and then he goes back to playing, just like real little kids. When she was shooting the show, Sainte-Marie, Wolfchild, and Cody would spend a few weeks or a month in New York, usually in a hotel close to Lincoln Center and Central Park. A typical day started when she arrived early at the Reeves Studio at 81st and Broadway and headed upstairs to her tiny dressing room. The wardrobe woman would show up with the day’s outfit, or Sainte-Marie brought her own clothes. They often shot two shows a day, which for Sainte-Marie meant memorizing two scripts with a baby on her hip. It was exhausting. And, rightfully so, the adults really came third in the list of Sesame Street’s priorities, right behind the Muppets and the children. Sonia Manzano offered her some very specific advice when Sainte-Marie joined the show. “She told me to be prepared to look ugly because the lighting was all for the Muppets,” she says. “She said, ‘Actually, we have a pretty good-looking cast, but we all look ugly because of the lights,’ and boy, was she ever right. You had to kind of leave your ego in the dressing room. If the Muppets messed up, you had to do it over again. But if you messed up, you might not get a second chance, because filming Big Bird and the other Muppets was so crucial. The live cast, we were all second bananas. But very happy bananas,” Sainte-Marie laughs. While the adults rehearsed the scenes, the kids who appeared on Sesame Street would play in a different part of the theatre, a big, decked-out playroom packed with things to do and people to watch them. When the cameras and actors and puppeteers were ready, the kids would step into the scene. Sainte-Marie has a soft spot for both of Spinney’s characters, Big Bird and Oscar the Grouch. 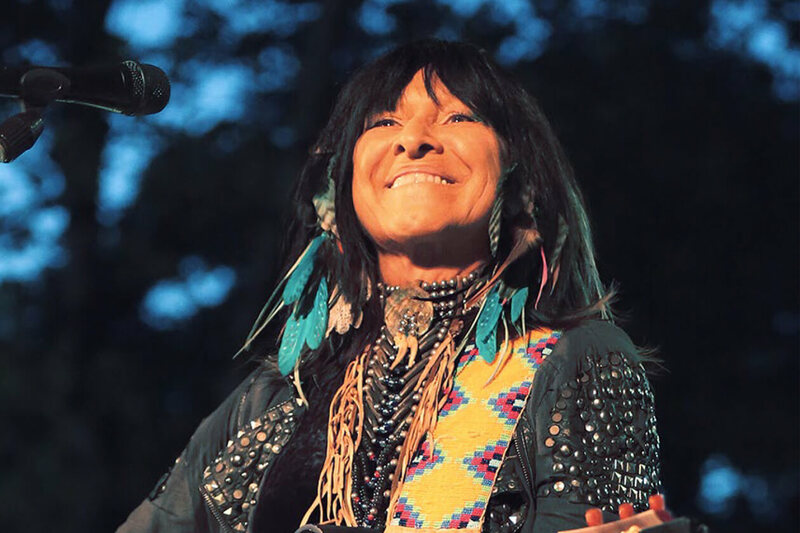 Excerpted with permission from Buffy Sainte-Marie: The Authorized Biography by Andrea Warner, foreword by Joni Mitchell. Available from Greystone Books.